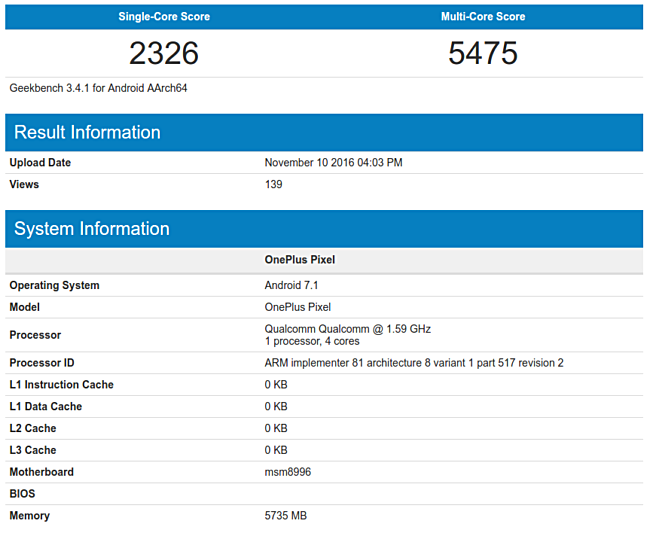 A mysterious OnePlus smartphone has been spotted on Geekbench. Listed as OnePlus Pixel, the device is powered by a Snapdragon 820 chipset and has 6GB RAM. The handset runs Android Nougat version 7.1. As you might already know, OnePlus is set to unveil a new phone dubbed OnePlus 3T on November 15. The possibility of the Pixel being 3T is almost nil given that the latter is confirmed to be powered by Snapdragon 821 SoC. Aside from what the benchmark listing has revealed, nothing else is currently known about the OnePlus Pixel. We’ll keep you updated as and when we hear more about the device.